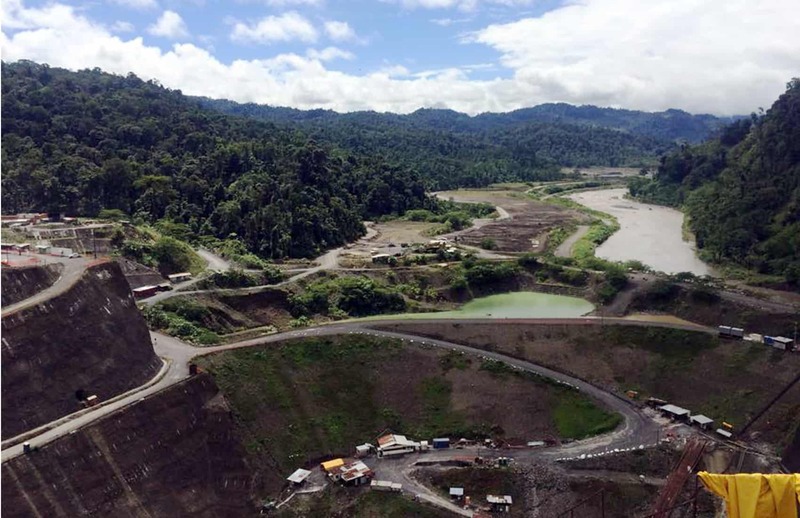 Workers from the state-run Costa Rican Electricity Institute (ICE) on Thursday finished placing the last layer of rock and earth that will support the Reventazón hydroelectric project, which when completed will become the largest in Central America. The 130-meter-high dam contaings 9 million cubic meters of material and will handle up to 118 million cubic meters of water from Reventazón River in the Caribbean community of Siquirres. ICE Executive President Carlos Obregón called the completion of this stage of the project a significant moment for Costa Rica’s energy sector. Work began in 2010 and is now 83 percent complete. “We are nearing the end of intense work that lasted almost five years and provided social and environmental compensation, employment and economic support to the Caribbean region,” Obregón said during a ceremony in which he drove a dump truck that poured the last of the material on the dam. “Reventazón will bring clean energy to the national electrical system that will be key for the country’s development,” he added. Pending work includes pouring concrete to shield the dam and setting several supports. Once that is finished, ICE will begin filling the reservoir with water from the Reventazón River. ICE estimates the project will be ready to begin supplying electricity for Costa Rica’s dry season in 2016. The 305.5-megawatt plant will provide electricity to about 525,000 homes. Built by 400 ICE workers, Reventazón is the second largest infrastructure project in the region, after the Panama Canal. Historically Costa Rica has met 95 percent of its electricity needs from renewable sources. But in recent years, the country has had to increase thermal generation using fossil fuels. Currently 88 percent of the electricity in the country comes from clean sources, ICE reported in April. Hydroelectric plants provide 68 percent of the country’s electricity, while geothermal plants provide 15 percent and thermal plants generate 12 percent. Other renewable sources supply a smaller share of the national electricity system, including wind power (5 percent), biomass (less than 1 percent) and solar energy (0.01 percent). State-owned companies produce about 85 percent of the country’s electricity, and national laws limit private generators’ participation to a maximum of 15 percent of the country’s energy market. Last month Presidency Minister Melvin Jiménez and ICE’s Obregón asked lawmakers to table Bill 18,093, known as the “Contingency Power Bill,” which sought to raise private generators’ participation to 30 percent. “Hiring more private power generators or increasing their share of the market is unnecessary, as the country’s electricity demand is covered through 2019,” Jiménez at the time told legislators on the Agricultural Affairs Commission. Last week, President Luis Guillermo Solís said that as long as he is in office, he would not support proposals to produce geothermal energy in national parks, a contentious issue that has politicians divided. At least three proposals to allow power generation in protected areas are currently under study by the Legislative Assembly. Two – Bill 18,182 and Bill 19,339 – were drafted by Libertarian Movement Party legislators and call for the exploitation of geothermal sources throughout the country, both by ICE and by private generators. A third – Bill 19,233 – presented by ruling Citizen Action Party lawmakers Ottón Solís and Javier Cambronero, proposes geothermal exploitation inside protected areas by ICE only and under strict environmental guidelines. President Solís’ statement does not necessarily mean that new geothermal projects will be prohibited. But his lack of support will affect the chances of approval of those bills in the full Assembly.